Simon Murphy (Sydney, 1973) is an international award winning, Dutch based, Australian orchestral conductor and violist with a special focus on music of the 18th and early 19th centuries. Performing at the world's most prestigious halls and festivals, Murphy has attracted praise from the international media and major industry awards for his fresh and engaging musical approach, with France's music magazine Diapason reporting, "The repertoire-refresher, conductor Simon Murphy radiates joie de vivre. His interpretation distinguishes itself by its enthusiasm and his approach possesses a classic élan, displaying delicate sensitivity." 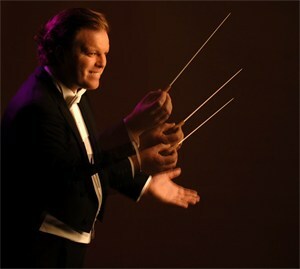 Working with both specialist baroque and modern symphony orchestras, Murphy has established an international reputation for his energising and invigorating conducting and orchestral leadership techniques, described by the BBC Music Magazine as "the best of both worlds". He is currently the chief-conductor and artistic director of The Hague's Baroque Orchestra, The New Dutch Academy (NDA). Heralded as "a musician with guts" by the Netherlands' De Volkskrant, Murphy has won international recognition for his dynamic and insightful performances of established orchestral repertoire, as well as for his pioneering work in bringing new, rediscovered masterworks to life on the concert platform and on disc. A world authority on the early, classical symphony, Murphy's discography includes world première presentations of works by 18th century symphonists Stamitz, Richter, Schmitt ("The Dutch Haydn"), Schwindl, Graaf and Zappa (PENTATONE). Murphy has won major industry awards, including the Netherlands' Edison Music Award and his ground-breaking 2003 recording of Corelli's Concerti Grossi was voted as one of the top five highlights in the 30 year history of the Holland Festival of Early Music Utrecht. European festival highlights have included productions for the Händel Festspiele Halle, Bachfest Leipzig, Thüringer Bachwochen, Musikfestspiele Potsdam Sanssouci, Istanbul Music Festival, Roma Europa Festival and the Festival van Vlaanderen. International concert touring has taken Murphy through Europe, the U.S., Canada, Russia, Asia and Australia, with broadcasts for the NTR, RNW, EBU, DLF, HR, MDR, RAI and ABC. Recent conducting highlights in the Netherlands have included cycles of Stamitz, Mozart, Haydn, Beethoven and Mendelssohn symphonies for Dutch radio at The Hague's Philipszaal, De Doelen in Rotterdam and Amsterdam's Het Concertgebouw. Future guest-conducting engagements include appearances in Scandinavia, Northern Europe, China and Australia, with recent guest-conducting highlights including Bach's B Minor Mass with the State Choir of Latvia in Riga, a double programme of Handel's Water Music and early classical symphonies with the Queensland Symphony Orchestra, and a series of performances of Murphy's own hand-crafted programmme An 18th Century Symphonic Grand Tour with the Strasbourg Philharmonic Orchestra. Murphy started learning violin at age of four, changing to the viola at age 11. He completed his undergraduate degree in music performance, musicology and fine arts at the University of Sydney in 1996, studying the viola with Leonid Volovelsky and early music performance with Hans-Dieter Michatz and Geoffrey Lancaster. Murphy moved to the Netherlands in 1996 where he was further educated by the leading lights of the Dutch early music movement. He studied Baroque viola with Alda Stuurop and took masterclasses with Lucy van Dael and Sigiswald Kuijken. He has performed extensively with legendary figures including Frans Brüggen and Gustav Leonhardt, in major European authentic instrument ensembles such as The Orchestra of the 18th Century, and between 2000 and 2005 was the violist of The Amsterdam String Quartet. Alongside his conducting activities, Murphy remains active as a viola soloist, recitalist and chamber musician. Also performing on Bach's own hand-held violoncello piccolo (or viola da spalla/viola pomposa), he was invited to give a special of recitals in original Bach castles as part of the Bachfest Leipzig and Thüringer Bachwochen. As a sought after educator, Murphy regularly gives masterclasses, workshops and lecture-recitals on topics including historically informed performance. Recent invitations include The Royal Conservatorium of Music The Hague, The Royal College of Music Stockholm, Beijing Central Conservatory, The Glinka Conservatorium Nizhny Novgorod and The Getty Center Los Angeles. Murphy is highly regarded for his creative and practical approach to concert and festival programming. Recent highlights include Black Magic, a programme exploring the late 18th century obsession with the supernatural, and the successful new stage production Mrs Cornelys' Entertainments, which celebrates the infamous 18th century London actress, singer, opera impresario and mother to Casanova's daughter, “Mrs Cornelys” a.k.a. The Empress of Pleasure. At the request of the Dutch government, he has regularly programmed, arranged and performed music for cultural diplomacy programmes, state visits and other major bilateral events, including in Rome, New York, Beijing and Sydney. In 2012 Murphy was appointed music programmer and artistic advisor to The Hague's new Embassy Festival. He is also curator of classical music for the Netherlands' Prinsjesfestival.